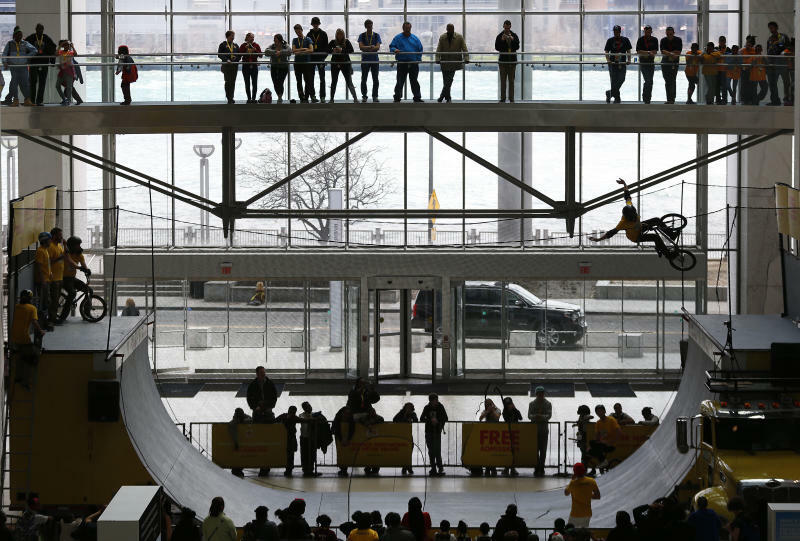 DETROIT (AP) -- Detroit's Cobo Center, which hosts the auto show and other major events, is changing its name to remove the surname of a former mayor known for his racist policies, officials announced Wednesday. The Detroit Regional Convention Facility Authority announced it has sold Cobo Center's naming rights to Detroit-based Chemical Bank in a 22-year deal that will generate $1.5 million annually. The new name will be announced later this year, after Chemical Bank's holding company acquires another financial institution , Minnesota-based TCF Financial Corp. In the meantime, the center's prominent exterior digital signage will combine the center and bank names. Authority Chairman Larry Alexander, who also serves as president and CEO of the Detroit Metro Convention & Visitors Bureau, said he sees the move as "killing two birds with one stone" — making the right decisions financially and socially. "No question that name, Cobo, has a negative history and connotation attached to it," he told The Associated Press. "I will have to say that our financial concerns were the first priority, but our second concern was to be sure we eliminate any past negative issue associated with the name." Albert Cobo, who served as mayor from 1950 to 1957, sought to keep blacks out of predominantly white neighborhoods. The convention center opened on the Detroit River waterfront in 1960, three years after Cobo died. "The Cobo era was marked by the wiping out of African American neighborhoods in the name of urban renewal. I don't believe our civic center ... should be celebrating that era," Detroit Mayor Mike Duggan said during Wednesday's announcement. Democratic Gov. Gretchen Whitmer echoed Duggan's sentiments, saying the Cobo name is "synonymous with division." "Right now, in our country and in our state, we've got enough division," Whitmer said. Vestiges of racism and intolerance are slowly being moved and removed in Michigan and other northern states, spurred by more widespread efforts in the South to erase the nation's slave past. In the Detroit suburb of Dearborn, a statue of former Mayor Orville Hubbard — who spent decades trying to keep the city all white — was socked away for more than a year after leaders decided it didn't belong outside a new City Hall. The Hubbard statue now stands beside a small museum. At the University of Michigan, regents have voted to strip a former president's name, Clarence Cook Little, from a campus science building because he lent his expertise to groups that favored selective reproduction, also known as eugenics. A bust of Cobo is no longer prominently displayed in Cobo Center. It now sits at the end of a long, little-used and dimly lit hallway a floor below the center's main entrance. In addition to the North American International Auto Show, Cobo Center also hosts the annual Fight for Freedom Fund Dinner, the largest fundraiser by the Detroit branch of the National Association for the Advancement of Colored People. The organization says it draws 10,000 people each year. "You can't change everything, but you can change some things. You can begin anew," pastor and Detroit NAACP branch president the Rev. Wendell Anthony said at Wednesday's announcement. The center was owned and operated by the city until 2009, when the regional authority was created. Officials said in a release that the money made from the deal with Chemical Bank will save state taxpayers millions of dollars and help the center "move toward becoming a self-sustaining facility" within about five years. Associated Press reporter Corey Williams contributed to this story. This story has been corrected to show that Duggan said, "The Cobo era was marked by the wiping out of African American neighborhoods," not "whitening-out."